I’m happy to report that Madelyn’s final night in her crib and first night in her bed were the exact same experience: boring! No muss, no fuss. No tears, no fears. I am still pinching myself how easily she transitioned. The day her bed arrived was a big day. It was Friday, her favorite day at school because of all the Shabbat fun she has in the morning. Then it was Halloween. Then it was bedtime. It was one of those go-go-go days when parents probably shouldn’t do things that are of the milestone flavor due to rushing around and a less-than-routine schedule, but we’re risk takers and like to play with fire like that. Her bed arrived while she was at school, and we spent the last hour of her school day making the bed and decorating her room so that she’d come home to a mostly complete version of her new living quarters. It was so fun to set up the new bedding and decor I’d worked so hard to coordinate and we couldn’t wait to show her the final product after I picked her up. I took it so seriously, I was just one headset away from actually becoming a Pottery Barn employee. We led her upstairs to her room and let her open her door. Her smile went from wall to wall, and she instantly declared that she loved “the pink bed with flowers!” We climbed into her full size bed and snuggled in the new sheets as she explored the new bed’s anatomy: pillows — two of them! 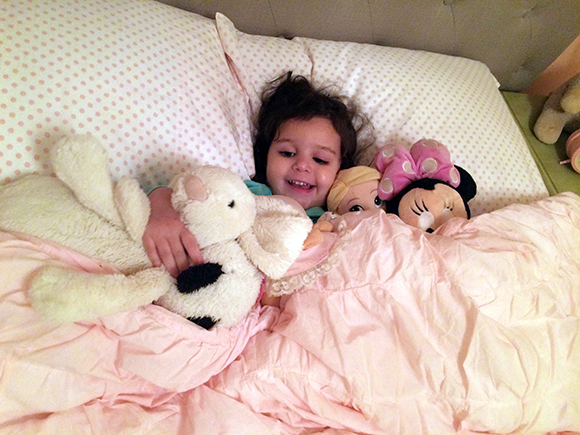 — sheets, a duvet, a quilt, and her favorite “friends.” The girl who had insisted that she loved her crib and didn’t want to give it to her baby sister truly turned a corner, and she continues to declare that she loves her big girl bed. On the left, Madelyn’s new bed. 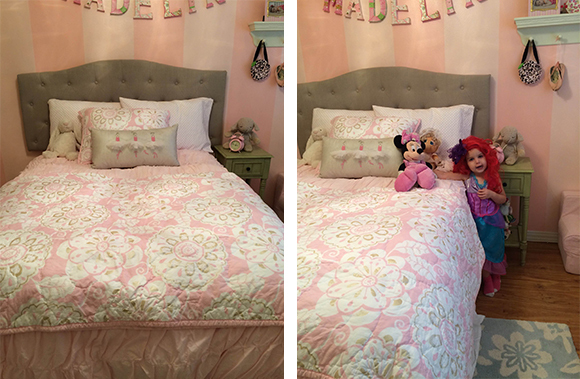 On the right, Ariel photobombing Madelyn’s new bed. After a fun night of trick-or-treating with friends, we weren’t sure what to expect for the new sleep routine. We grappled with the concept of teaching her about staying in her bed throughout the night and not to play with her toys during sleep time and how she can’t go downstairs and other rules that come along with new freedom. But it dawned on me that we should use the first night as our base, our foundation, and it would only possibly cause confusion or problems for my goody-goody daughter who never even tried to climb out of her crib. If there was a problem by the morning, then we would address it. But to put thoughts in the girl’s head when it might not even occur to her to run wild around the house, might just end up shooting us in the foot later. So, we read a story, tucked her in, gave lots of kisses, and left the little girl in the big bed until the morning. 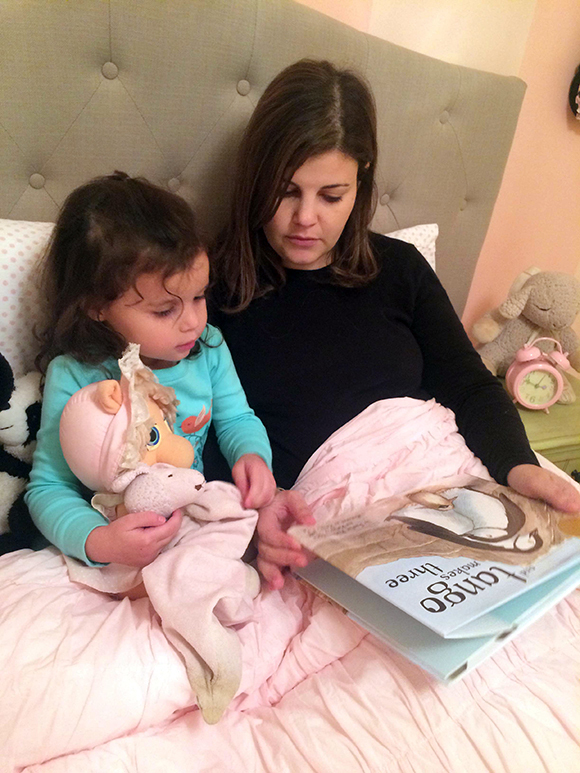 Reading Tango Makes Three from Madelyn’s new “nest” — we love this book! “Comfy and cozy” surrounded by all of her friends. We are one stuffed animal shy from promoting her to a king size bed. Then I stared at the monitor all night. I haven’t looked at the monitor much since Madelyn was an infant. I’ve never lived in a big enough house that I wouldn’t hear crying without the monitor, and watching a sleeping baby is actually kind of boring. So, the monitor has always been back-up for comfort, but I’m not the mom who’s tied to it. Except for the first night in her big girl bed. Without rails. And with lots of extra bedding. But finally, my heavy eyelids gave out and I slept on and off all night, hitting the display button as ferociously as I hit the snooze button on my alarm clock every morning. “Is she? !” No. “Where is? !” In bed. “How is? !” Sleeping. All my light sleeping and frequent wake-ups throughout the night were unnecessary. At 8:15 on Saturday morning, I woke up with a jolt half expecting to hear Madelyn banging pots and pans downstairs in the kitchen or her laughter outside riding around on her tricycle. I looked at the monitor and she was fast asleep. In the era of the crib, it wasn’t abnormal for her to sleep until 8:30, 9:00, so this this wasn’t totally crazy, but I thought her new surroundings would surely throw her off. I was up-up for the day, so I relaxed in bed waiting for her to wake up to see what she’d do. 8:30, 8:47, 8:55, 9:10, 9:15… nothing. Still and quiet. No red light blinking on the monitor to indicate sound and no grayed out three-year-old thrashing around on the screen. And then it happened. 9:20 and she started to stir. She sneezed a cute little morning sneeze. Then she sat up. Looked around her room. And I braced myself for the cry and the plea to be rescued. She greeted her “friends” with a cheerful good morning not dissimilar from Cinderella to her woodland creatures who lived in her attic, crawled to the foot of her bed, turned her body over, and thumped down on her two feet. Then she went nose-to-lens with the camera on her dresser where I watched her up close and personal as she undressed herself, peeled off her Pull-Up, opened her drawer, fished out a pair of likely princess undies, and then she disappeared out of frame. I heard the rolling of her closet door slide open and the clanking of hangers and clothes swishing around. Then two soft thumps, one for each foot, and silence. And that’s when I died. I died again. Because I am a cat. I keep wondering when this luck will run out (March 4th is the answer). There’s no way lightning can strike twice. Baby in the Utey, if you can read this: It’s A-OKAY to take after your big sister!!!! Madelyn always been such an easy transitioner. Her first day without a bottle of milk? Didn’t even flinch. Potty training: Diapers whaaaat? And now the big girl bed: She was Goldilocks on the first try and it was juuuuuust riiiiight. I was so proud of her, but doubted the streak would carry on. Miss Piggy, my own childhood stuffed Muppet that she sleeps with, is… rotund… and had the end spot on the bed (bad call, parents). She rolled off. Pig down. I picked her up, placed Piggy between Madelyn and Rapunzel, and tucked everyone back in. I got back to bed and Bryan asked what was wrong with Madelyn. “Piggy needs bed rails,” I said. And then we laughed ourselves back to sleep.